Checked Off My Norway Bucket List: Drive the Atlantic Road! I’ve been fascinated by the Atlantic Road on Norway’s west coast since I learned about it a few years ago. It looked like a real life rollercoaster ride hopping from island to island along the outermost edge of the coast. Bad weather seemed to make it even more extraordinary. The road is one of Norway’s 18 official national tourist routes. It opened in 1989, and in 2005, it was voted Norway’s “Engineering Feat of the Century”. 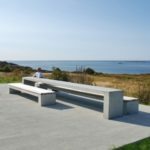 It is built on several small islands, skerries, and landfills and is spanned by seven bridges. Many consider it one of the world’s most beautiful drives as well. We came at it from the north via Kristiansund after a visit to Trondheim. 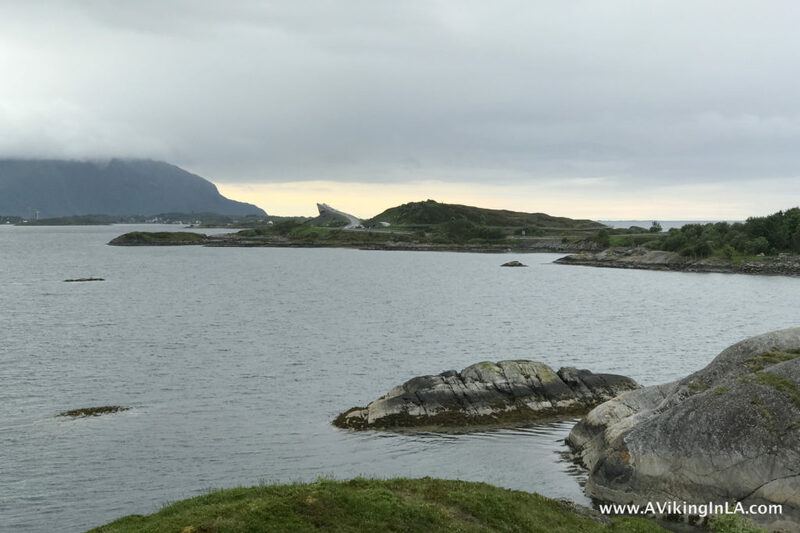 We drove through Atlantic Ocean Tunnel (an undersea tunnel about 3.5 miles long) from Kristiansund to the island of Averøy and made our way along Route 64 with a final destination of Molde. 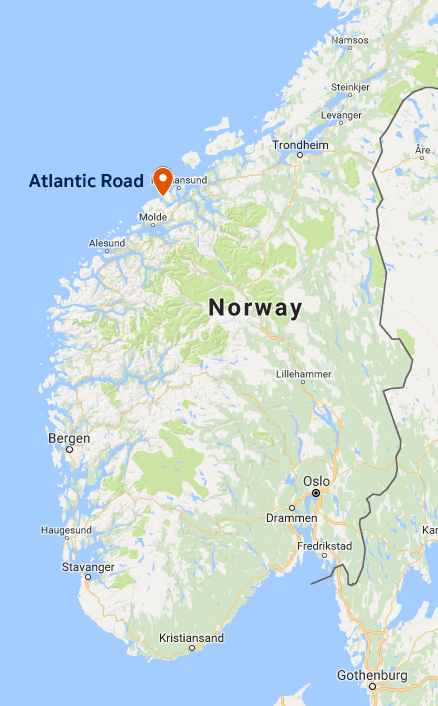 A quick Internet search of the Atlantic Road will tell you it is a 5-mile stretch between Kårvåg and Vevang along Route 64 (Wikipedia, Google Maps, various articles). 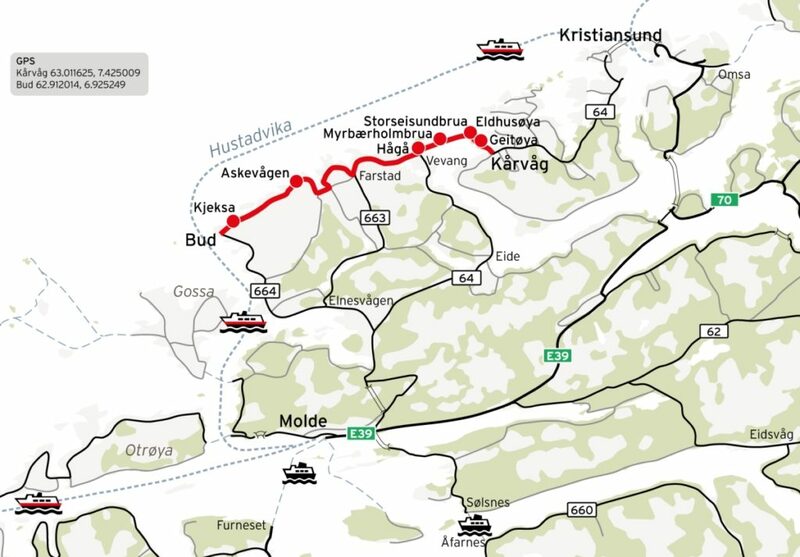 However, as you can see on the official site of National Tourist Routes in Norway, the full route is actually about 22 miles and goes all the way to Bud from Kårvåg on a series of smaller roads (Roads 64/242/663/238/235). 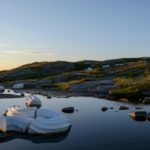 The most dramatic stretch, however, is probably the 5-mile section between Kårvåg and Vevang. Due to time constraints, we were unfortunately only able to drive the 5-mile stretch. Bad weather during our stay in Trondheim meant we had to use the morning of our departure for some must-see sightseeing and so we got on the road much later than planned. Also, we were delayed by an unexpected ferry ride which added some down time to our drive. We didn’t get to the start of the Atlantic Road until 6:30PM! Yes, it stays light late during summertime, but we still had to get to our hotel in Molde that day and the kids could only handle so much in a day. And our stomachs were getting hungry for dinner as well. For us, the weather was neither good nor bad. It was cloudy and drizzled on and off. In one way, that was good because it allowed us to get out of the car without getting soaked. But, on the other hand, a beautiful evening sun and clear skies would have added greatly to our enjoyment of the area. Despite the constrained time and lackluster weather, it was an interesting experience to drive along the Atlantic Road and I’m glad we went out of our way to do it, but I was a little underwhelmed and feel it merits a revisit. Part of the reason I felt a little underwhelmed was that 5 miles is a very short stretch after 4 ½ hours of driving from Trondheim. Had we had time to drive and explore the full route I’m sure we would have felt it much more worthwhile. 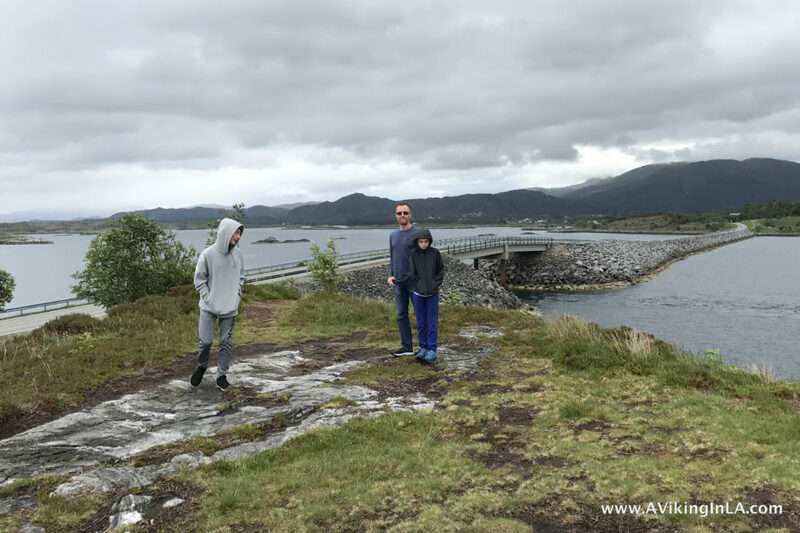 For us, the highlights were a short walk around the island of Eldhusøya and the drive over the main bridge Storseisundbrua. The island of Eldhusøya has an elevated path that goes around the island and provides views of the open ocean beyond. Along the path, there is a memorial to those lost at sea (and even a geocache!). 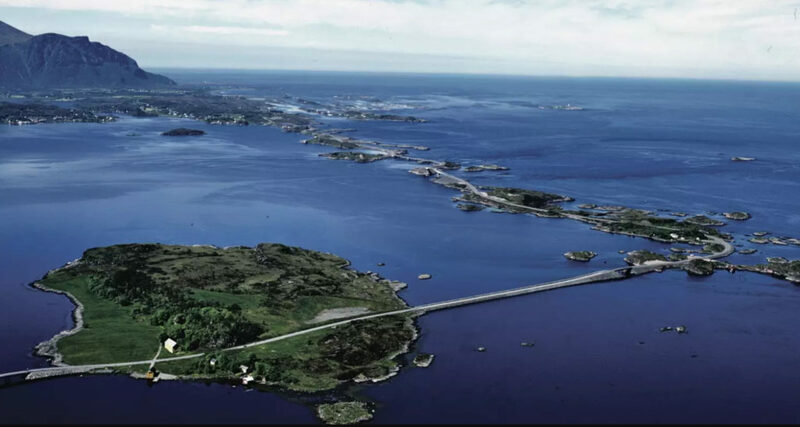 Storseisundbrua is the longest bridge on the route and the route’s symbol. As you hit to crest of the bridge, you get a wonderful view of the road and the many little islands ahead. Too bad there wasn’t a stopping point there. Another interesting bridge we crossed was Myrbærholmbrua. It has specially built fishing walkways on either side. Had we had more time I would have liked to park and walk along them to see what kind of fish they were pulling in. 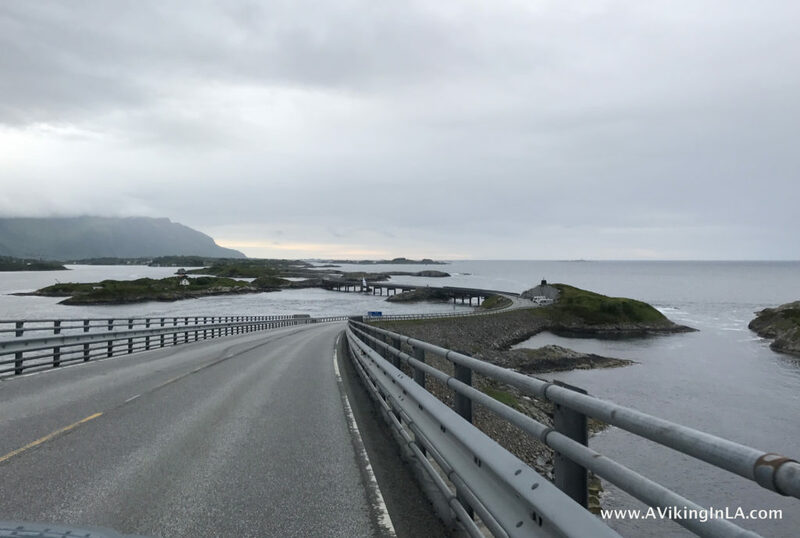 Once back in Los Angeles, my aunt shared with me a Norwegian article and video from Møre og Romsdal Reiseliv’s website describing seven “fresh experiences” you should make time for if you’re visiting the Atlantic Road. One of those experiences, the Eldhusøya visit, we did have a chance to do, and others would not have been appropriate for our family, but I would have loved the opportunity to visit Håholmen, hike the coastal trail at Farstad, and see Columna Transatlantica with our own eyes (does it really look like toothpaste as my kids believe?). Those activities are on my list for next time. 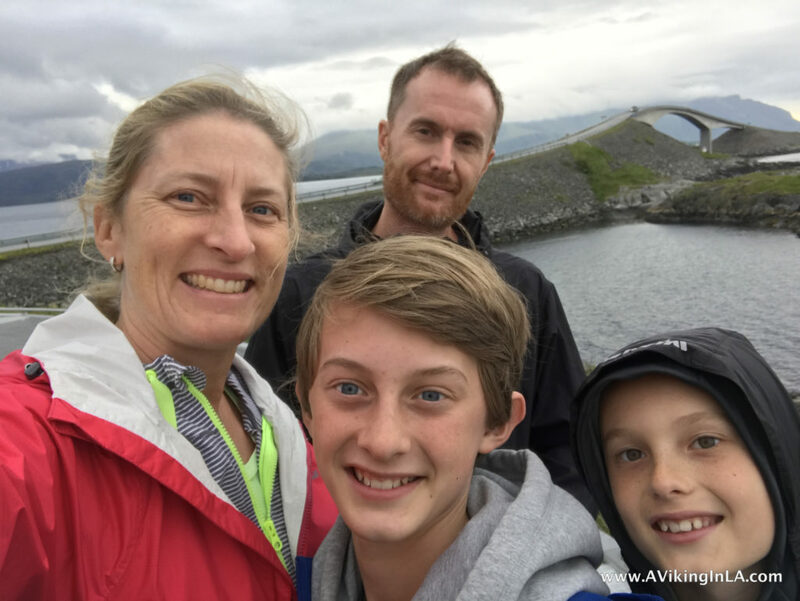 My tips for travelers headed to the Atlantic Road – make sure you have lots of time to enjoy and explore and plan to drive the whole 22-mile route. If I have the opportunity to return to the area, driving the whole route with time to spare will be top priority. I would even consider bookending my visit with nights in Kristiansund and Molde (or maybe even on Håholmen) so that I could have a whole day along the route. The Atlantic Road deserves so much more time than we were able to give it, but I really enjoyed the introduction to it. Checked Off My California Bucket List: See the Poppies! This entry was posted in Norway, Travel and tagged Atlantic Road, bucket list, Kristiansund, Molde, road trip by Patricia Zanuck. Bookmark the permalink. Å så gøy! Denne turen må komme på min liste! 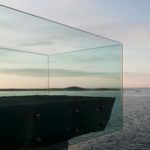 Beautiful pictures and what a great trip story of the Atlantic Road! Safe travels, friend!